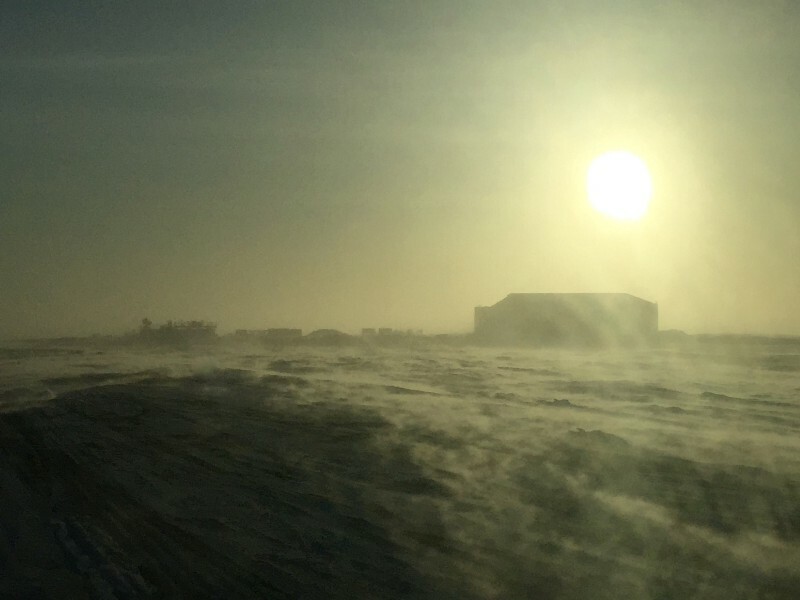 Snow blowing over the surface, as seen from the Oliktok runway looking back towards the AMF-3 and the hangar this morning. I didn’t provide a blog entry yesterday — I wish I could say that was because the weather broke and we had a fantastic day of flying, but I can’t. Winds are still howling at 30–40 mph as I type this, and access to the site has been limited due to drifting snow on the way to the AMF-3 — upon arrival this morning, we watched the USAF contractor who performs snow removal duties for ARM plow his way through 3–5 foot drifts in front of the AMF-3 using a giant front-loader. He had done the same thing just 24 hours earlier — crazy to think about the amount of snow that is getting redistributed around the surface under this snow event while none has fallen as precipitation (note the blue skies in the photos below…). The Catepillar front-loader plows through the large drifts in front of the AMF-3 this morning. He had cleared that area less than 20 hours earlier! We did execute a very short DataHawk 2 flight yesterday, though it was rather unsuccessful due to a combination of the weather conditions and a mechanical issue that resulted in a fairly wild flight. The plane was recovered without incident, and Tevis and Doug have been troubleshooting a couple of aircraft items since. Phillip and I decided that we would try to obtain some additional measurements even if they were from instrumentation sitting on the roof of the AMF-3. 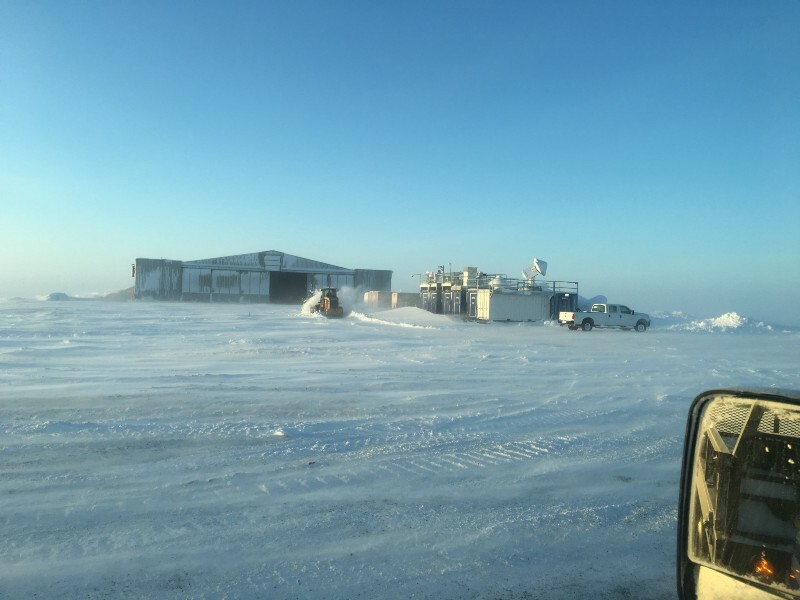 Later this summer, ARM will be installing an “Aerosol Observing System” to observe the properties of particles in the atmosphere around Oliktok Point. These particles are critical in a variety of ways — first, they modulate the formation and lifetime of clouds, which in turn impact the transfer of energy through the atmosphere. Second, they scatter and absorb energy themselves, altering how much of the sun’s radiation reaches the surface at any given time. Another interesting thing to think about is how the aerosol particles here differ from those at Barrow. Not only is there substantial industrial activity around Oliktok Point due to energy extraction activities, but there are also seasonal differences in the coastal environment, with Barrow generally having more open water during colder months, and deeper ocean close to shore. 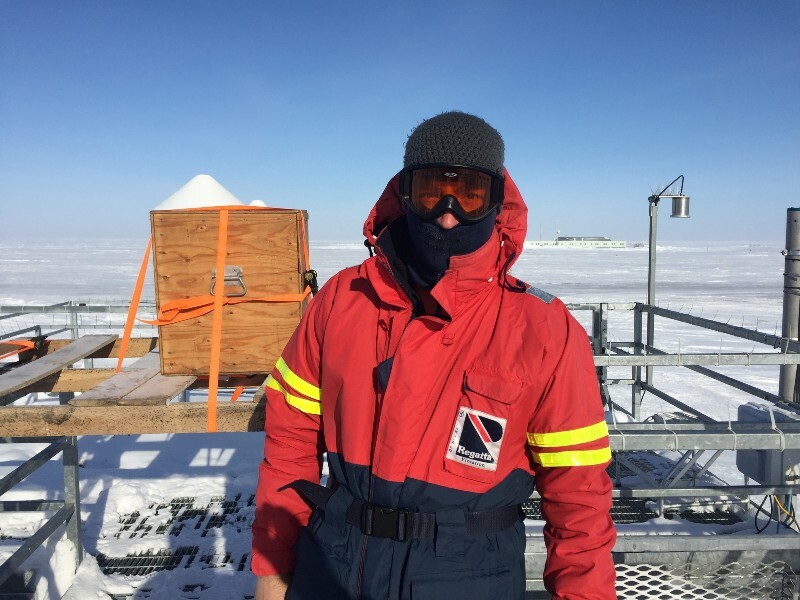 Anyway, one of the sensors that we are up here to fly on the Pilatus is the “Printed Optical Particle Spectrometer (POPS)”, developed in the NOAA Chemical Sciences Division by Ru-Shan Gao and colleagues. This instrument provides information on the number of particles present and their sizes. This morning, we spent time building an insulated enclosure for POPS so that it could operate on the roof to sample the local particles. It feels good to get some of the first aerosol measurements at this site! 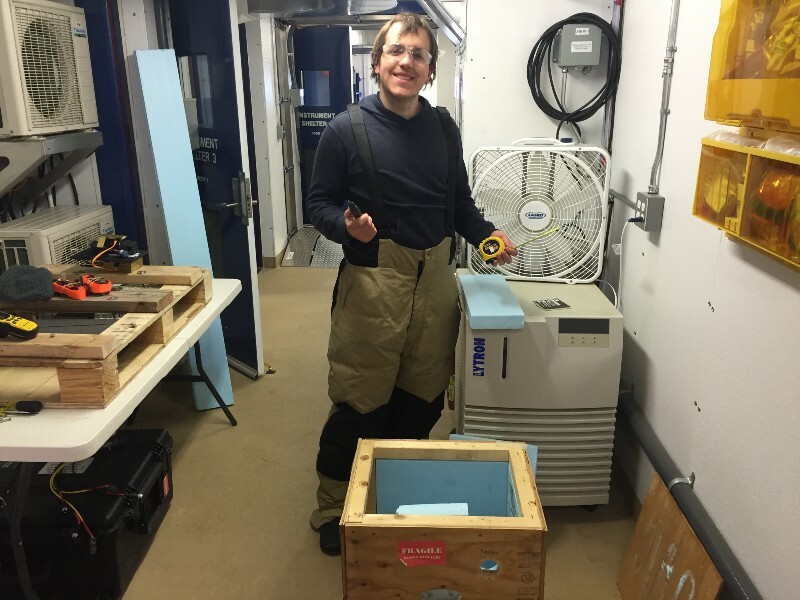 Phillip working to prepare an insulated box for operation of the POPS aerosol sampler on the roof of the AMF-3. A photograph of Gijs standing with the POPS box on top of the AMF-3. This afternoon, the winds are forecast to keep blowing — we’re keeping a close eye on things, because if there is a lull, we want to make sure we take advantage. 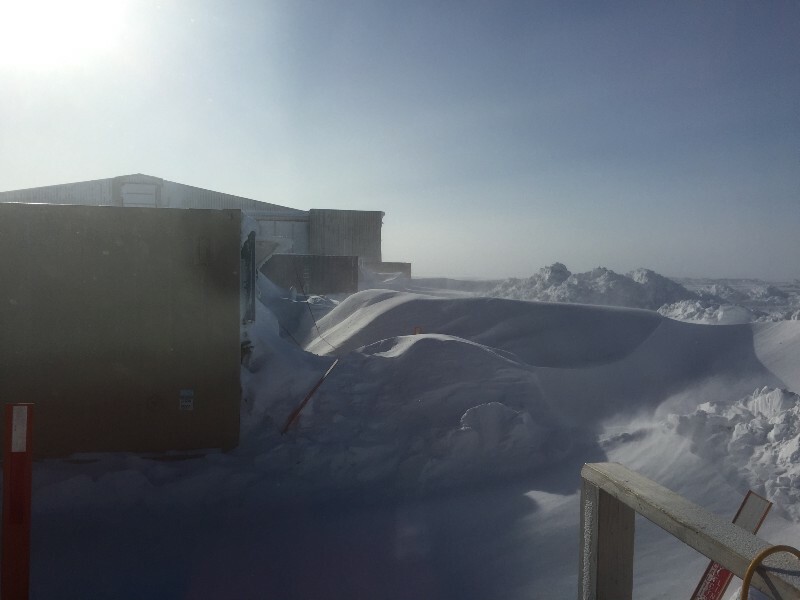 However, given the conditions and the potential for substantial drifting, we are planning to stay put at the ENI NOC camp unless the winds subside a bit… Frustrating, but not much we can do to slow the wind.